SOMMS, Other Guitar Effect from Dwarfcraft Devices. 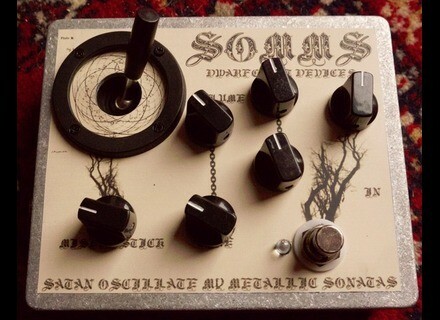 On 11-11-11, Dwarfcraft launched a new pedal: Satan Oscillate My Metallic Sonatas, or SOMMS. 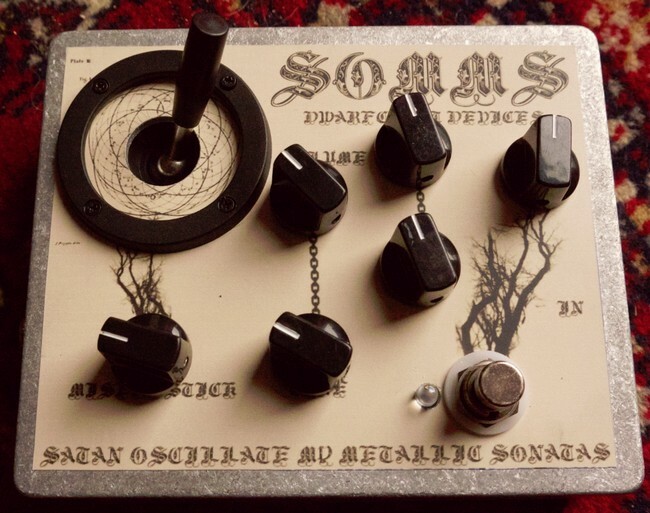 SOMMS features four oscillators, one low frequency rhythmic driver, one tunable audio drone, and a pair of squealing singers controlled via joystick. These are all mixed via a network of volume knobs. To top it off, they added an instrument input! Finally, you can have a Dwarfcraft synth on your pedal board, with in and out holes. SOMMS will be available to ship next week, $185 to retailers, $275 to customers. Also, the Bit Mangler, Synth Mangler, and Dream Mangler will all be discontinued as of 12-31-11. Drarfcraft say they will take orders for these pedals through the end of the year. The creator of the Manglers, Devi Ever has no current plans to continue production of these. Dwarfcraft also say that at next January's NAMM, they will release at least two more pedals, The Pitch Grinder and Stomping Double Squaresnakes. TC Electronic Michael Paget TonePrints Michael ‘Padge’ Paget, lead guitarist of metal sensation Bullet for My Valentine, creates personal ‘Sunny Day’ and ‘Tears’ TonePrints. Seymour Duncan Gus G. FIRE Blackouts System Seymour Duncan announces the release of a new guitar pickup system that combines aspects of traditional passive pickups and active designs. Dynamo Amplification Grand Tour Series Dynamo Amplification introduces the Grand Tour Series line of custom guitar amplifiers and cabinets designed for touring and live performance.